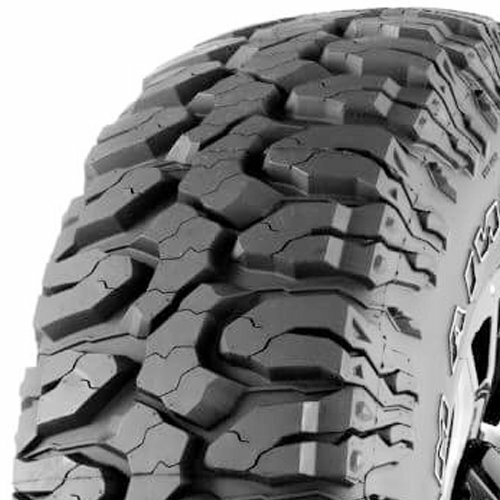 For superior traction in harsh terrain, look no further than the PATAGONIA M/T off-road tire. Whether its rocks, mud, snow or sand the PATAGONIA M/T is one tough tire and will provide maximum traction in any terrain. Designed to be at home rock crawling, exploring the desert, mud bogging, playing in the dunes, or a casual drive through mountain trails, the PATAGONIA M/T has all the attributes to overcome any terrain. The high-void tread design is engineered to provide aggressive biting edges while promoting self cleaning. Staggered, off-center tread blocks provide increased traction while enhancing on-the-road performance. The PATAGONIA M/Ts 3-ply sidewall provides additional protection against impact damage, while stone ejectors combat stone drilling, especially useful for rock crawling and all-terrain exploration. Built to tackle rugged terrain anywhere you may want to explore, the PATAGONIA M/T will allow you to push your vehicle to the limit.